If you did your first trip to the Big Apple right, you probably started with a big slice or two of New York-style pizza. From there, hopefully you moved onto a New York hot dog and then a hefty sandwich from a New York deli. These classic eats are part of the official NYC experience even if you did have to pull out the stretchy pants when you got home. If only there was a way to enjoy those treats without breaking the calorie bank. I ordered a delicious Hash Brown Sausage Breakfast Casserole at the cutest diner when we were in NYC. I had to come home and recreate it. I think mine turned out even better! Using a few simple ingredients, you can make this breakfast casserole or have breakfast for dinner in your own home. 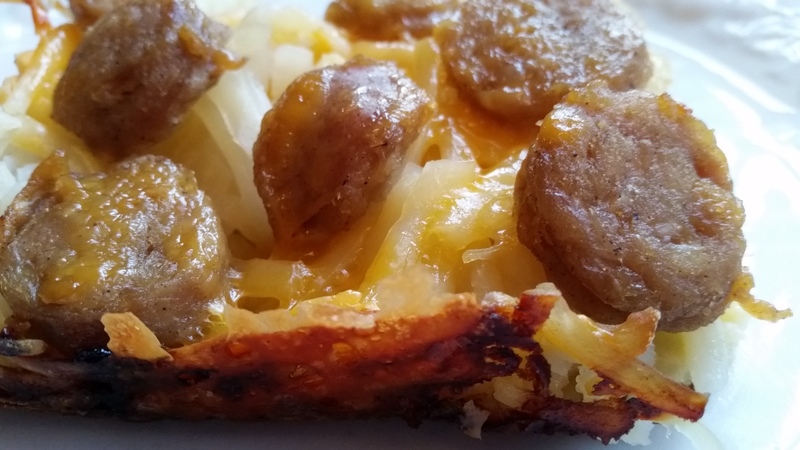 What you will need to make Hash Brown Sausage Breakfast Casserole: al fresco all natural’s fully cooked sweet apple chicken sausage, hash browns, eggs, sharp cheddar cheese, salt and pepper to taste. Al Fresco’s all natural’s fully cooked sweet apple chicken sausage is 70% less fat and 30% less sodium than pork sausage. It’s also dairy and gluten free! I love NYC! I miss taking the ferry into the city for shows, dining and all of the wonderful art exhibits! And why does al fresco Love NY lately? Now through May 13, they are hosting an al fresco NYC Gourmet Getaway Sweepstakes. Enter to win an all-expenses paid weekend getaway to NYC including $1000 spending money plus a tour and private dinner prepared by Bon Appetit’s Executive Chef in the Bon Appetit Kitchen. 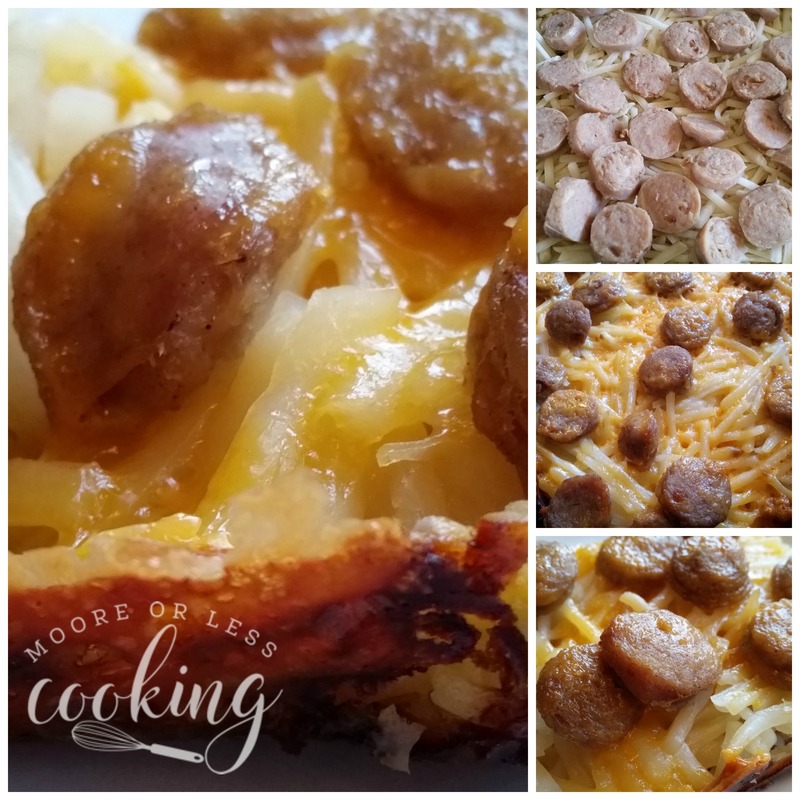 Easy and delicious Hash Brown Sausage Breakfast Casserole. 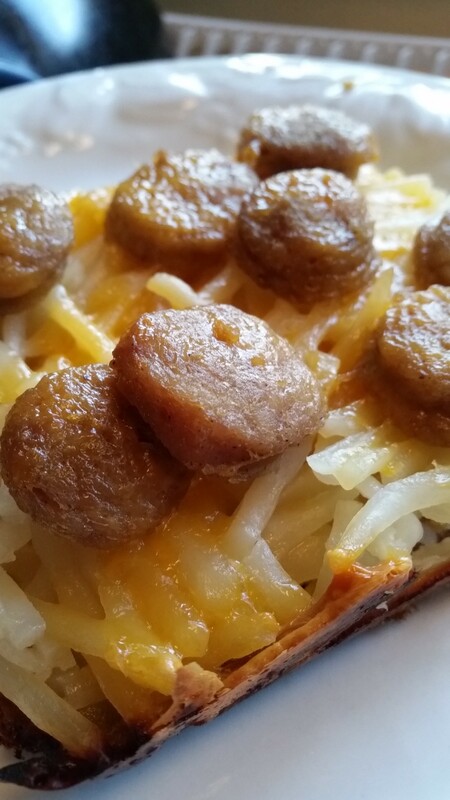 Made with cooked al fresco sausage, hash browns and eggs for a perfect breakfast or dinner! Spray a 13- x 9-inch baking dish with Pam baking spray. Prepare hash browns according to package directions, using ½ teaspoon salt and pepper. Place into baking dish. Cut sausages into bite size slices. Place over hash browns. Whisk together eggs, milk, and remaining 1 teaspoon salt. Pour evenly over potato mixture. Bake at 350° for 35 to 40 minutes, until egg mixture is set and hash browns are golden brown. To see the entire line of al fresco products, please visit alfrescoallnatural.com. This post is sponsored by al fresco, all opinions are my own as always. I love the delicious Hash Brown Sausage!! !It looks like very delicious!!! I love food writing!!! I am Weining Wang, an international student from China. This is my food blog: http://www.ningweiwangfood.simplesite.com Having grown up in a big family with famous chefs for generations ever since my grand grand-father, I was inborn with the mission of keeping the inheritance of traditional food culture. At the age of 10, I started to publish articles on Chinese Literature Song QING Ling Foundation. I used to combine culture and history together. Besides getting to know the food cooking skills and the history stories behinds them, I also wanted to study the vicissitudes and protection of traditional culture. Can you read my food blog? Can you add a link in your food blog（about my food blog)? I sent an E-mail to you!!! I love food writing!!! Oh god! That looks really mouth-watering, nice recipe shared! Looks like a perfect recipe for breakfast, great!